Nuclear magnetic resonance (NMR) spectroscopy has been one of the most powerful tools for studying molecular structure and dynamics for more than 65 years. Undergraduate science majors first use it to analyze organic compounds. Biochemists employ two-dimensional NMR techniques for determining the structure of large macromolecules, like proteins. 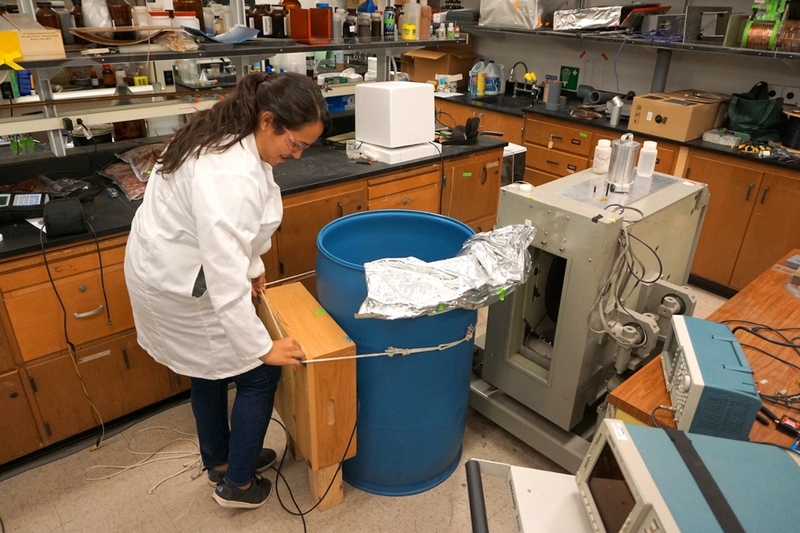 Now researchers in the UC Davis Department of Chemistry are wielding the power of NMR to approach issues in the food and wine industry, including the commercial scale detection of tomato paste spoilage. Michele Martin started working with Professor Matt Augustine as an undergraduate at UC Davis, where she first learned the finer points of applying NMR to emerging world issues. Since joining Matt's lab as a graduate student, the two have been developing a sensor that can detect tomato paste spoilage through commercial-sized bins. This would allow the tomato paste industry to monitor the freshness of their products at the processing facility before shipping to distributors. 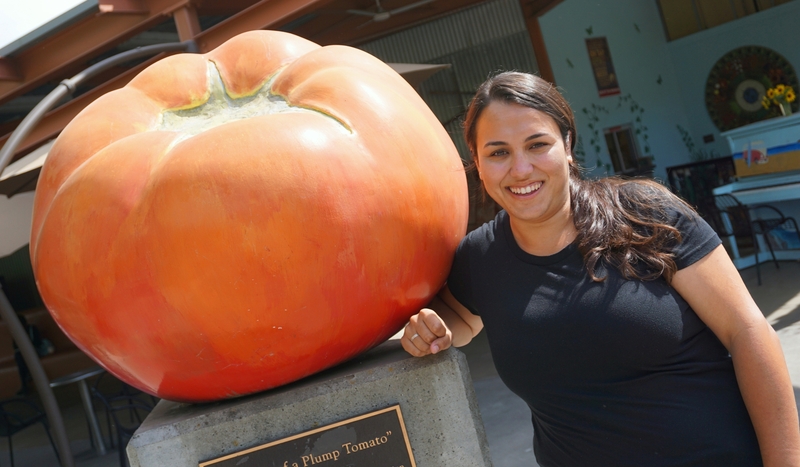 "The ultimate goal is for [the detector] to be a red light/green light, where an employee at a tomato paste facility can put it up to a bin, push a button and tell whether the product is good or bad," explains Michele. To do this, the sensor needs to be portable, able of accommodating the bin's geometry and have the capability to probe containers lined with aluminum metal. "The metal attenuates the magnetic field necessary for getting an NMR signal," starts Michele, "which blocks detection without opening the bins." To work around the signal attenuation, Michele employs a handheld permanent magnet that operates at lower field strengths. The small magnet is interfaced with a single-sided coil that can be placed flush up against the bin for detection. This is in stark contrast to the massive high-field superconducting magnets most familiar with chemists, which entirely encompass the sample being analyzed. After applying an inhomogeneous magnetic field to a bin, Michele is able to observe differences in the macroscopic properties of a spoiled versus unspoiled sample. One such difference is sample viscosity, which decreases as spoiled tomato paste becomes more watery and fluid. To directly measure these properties, Michele uses her instrument to collect values for transient NMR relaxation signals, including T1 (longitudinal relaxation) and T2 (transverse relaxation). "We use an inversion recovery pulse sequence to measure T1 and a Carr-Purcell-Meiboom-Gill pulse sequence to measure T2. We analyzed 30 spoiled tomato paste samples with a wide variety of different factory relevant spoilage conditions. All the samples had T1 and T2 values that differed from the relaxation rates of the pristine tomato paste samples." By combining the analytical power of NMR with a simple portable sensor, Michele and Matt are developing a unique technology that has the potential to address unmet concerns in the food industry. "I like that this project has the potential to be turned into something that immediately can be used--that it extends outside the lab," tells Michele. Implementing this work will help the tomato paste industry avoid costs associated with shipping and disposing of spoiled product, potentially saving companies millions of dollars annually.